Aid began reaching isolated areas of the Indonesian island struggling after a powerful earthquake that killed at least 131 people, while rescuers Wednesday doubled down on efforts to find the dead, pulling another body from the rubble. 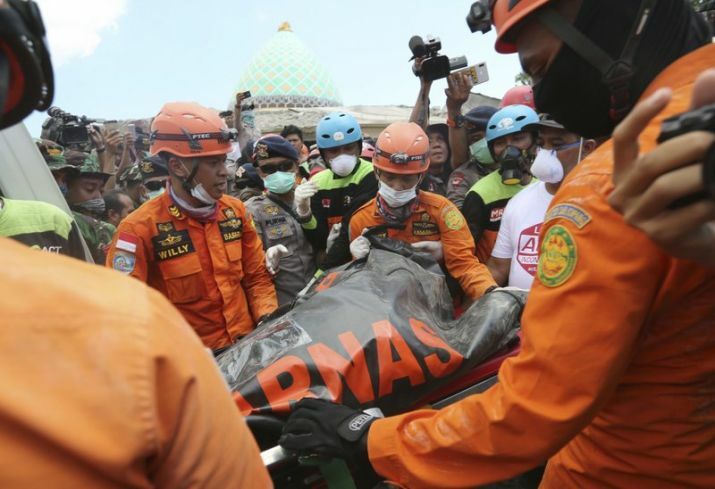 Mataram: Aid began reaching isolated areas of the Indonesian island struggling after a powerful earthquake that killed at least 131 people, while rescuers Wednesday doubled down on efforts to find the dead, pulling another body from the rubble. Volunteers and rescue personnel were erecting more temporary shelters for the tens of thousands of people left homeless on Lombok by the magnitude 7.0 quake on Sunday evening. Water, food and medical supplies were being distributed from trucks. The military said five planes carrying food, medicine, blankets, field tents and water tankers left Jakarta for the island early Wednesday. A woman’s body was recovered from the rubble of a collapsed mosque on Wednesday morning in Bangsal district in the north of the island. The national disaster agency’s spokesman Sutopo Purwo Nugroho said the death toll had risen to 131 from 105 announced Tuesday. He told a news conference that there are reports of other deaths but they still need to be verified. The toll is expected to increase, he said. Nearly 2,500 people have been hospitalized with serious injuries and more than 156,000 people are displaced due to the extensive damage to thousands of homes.